In a world where information is ever more readily available, it can sometimes seem as if there are few real mysteries left, and for that reason North Korea can represent a darkly fascinating horizon to many of us. But what if you found out as a filmmaker that you had a realistic opportunity of crossing into this shadowy realm – would you take it? 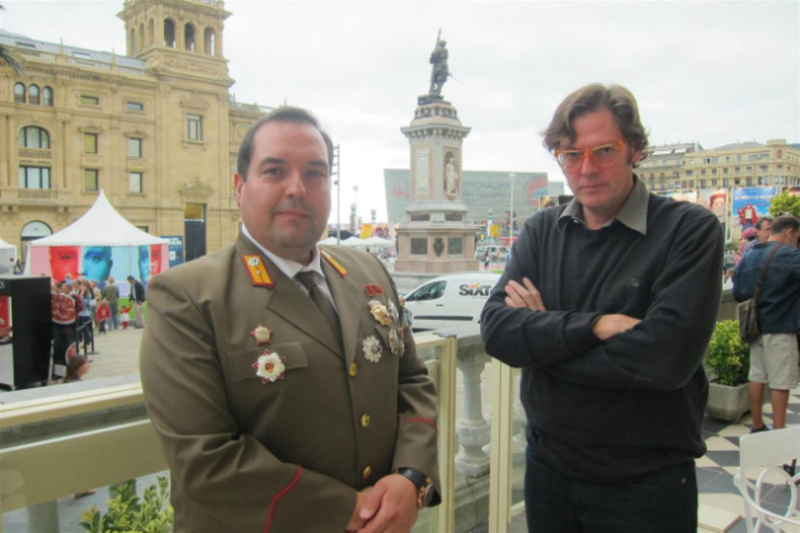 After years of perseverance, that’s what documentarian Alvaro Longoria discovered upon finding a mysterious Spanish-North Korean called Alejandro who had powerful ties with the Kim Jung-un cadre. The feature he subsequently created has played at the Festival de San Sebastian, received distribution in a number of countries (including now most recently the UK), and saw Longoria nominated for his second Goya Award, so it’s safe to say it’s been a relative success. But the piece of work produced is also pretty fascinating. It’s constantly filled with a quality of life which you certainly might not expect. And at the same time, it’s also bursting with a desire to take a look at the propaganda which exists both inside and outside of North Korea. So The Propaganda Game may well not be the film you expected to see. Though you shouldn’t be disappointed by the its highly pressurised and level-headed attempt to work out what’s going on in that obscure half of the Korean peninsula either. In fact, Longoria puts other recent attempts at docs about North Korea to shame (particularly The Lovers and the Despot). ScreenAnarchy: It seems like your film intends to take the documentary genre away from a world of absolute truths, is that something that really interested you? Alvaro Longoria: I think for me this was the real thesis of the film. I guess I wanted to make everything look like propaganda, show you propaganda and yet never do propaganda myself. Now I know that that can be quite tough for a lot of people; for example, when a lot of people come out of my film they tell me, “I’m very frustrated, because there are so many things that I don’t quite know and so many things I haven’t thought of before.” But I just think that ultimately if your film generates any kind of feeling in your audience, that’s a good thing and it’s a sign I’ve achieved my goal. My goal was always to make you think, “Okay, I’ll have to think twice next time I assume all these things they tell you about North Korea are true.” Maybe what they’re telling you are not true truths. You have to think about it, because maybe you’re being played with. Did you try to prepare for this kind of manipulation from both sides yourself? I did talk to some people who were very knowledgeable about this kind of thing – people who worked in intelligence – and they kind of made me aware of what was going to happen. That meant that I was at least warned that I would go through certain stages, you know, because apparently this kind of show has been done by the North Koreans many, many times. As this sort of secretive, communist country, it’s something that they do have to do quite often: taking in some foreigners like this and then taking them to certain set places to show them how marvellous everything is. It's a show, but it works quite well if you’re constantly only showing beautiful and wonderful things. Except when you’re prepared for it, and you know it’s going to happen, it is quite hard to shake the impression that they’re actually not very good at it. That was kind of the feeling I had the whole time: these guys are not that good at this. I certainly didn’t believe what they told me was true, in fact nobody did. I mean, when you take me to this fantastic museum that’s supposed to be about the heroes of North Korea or to a university, and in both cases there’s absolutely nobody there – and I mean literally nobody – then it really doesn’t work. You just immediately realise that’s just propaganda too, so a lot of the time I was very disappointed. I was really expecting them to be savvier about their propaganda techniques towards the West, though. Do you think contemporary documentaries are exploring the nature of truth much more these days? I do think that there is a big gap now in the world we’re living in. There’s this whole field of in-depth analysis that is missing. I know that there are good examples of in-depth analysis being done on the news or online every day, but those do not necessarily tend to reach the masses. Many of them only ever get to see what they read in the newspaper in the morning, and that definitely doesn’t give you enough information to get an informed view, because by reading the papers you don’t learn anything. I mean there’s lots of intelligent arguments that you can make in a newspaper article or with a cute quote, but you know that it’s never going to be a thorough analysis. So I think that’s where documentaries have found a niche now, and I think that’s why they’re enjoying such a resurgence in their success. Especially with the new networks and the new ways in which people consume films now. So you think docs will be able to connect these issues with more people and in a more meaningful way? I think the documentary is really able to cater to a need for in-depth analysis and yet at the same time be entertaining, meaning they’ll have more meaningful effects in my opinion. I just don’t think people are getting that in the news anymore, because that has become this kind of homogenous sphere where they actually spend most of their time talking about football – which I do think is great. After all, that’s what a lot of people want. It’s just that at the same time, some people what to know more about things, and it’s hard for them because where do you go? They don’t really want to read a newspaper, and they want something that’s quite quick and easy to consume. So I guess documentaries will be able to do that for them more. What do you think the Kim regime thought they would achieve by letting you make this film? Funnily enough, I wonder that myself. My theory is – and it’s just a theory, because I’m not certain – but I think they’re trying to present a much more amicable image of their country to the exterior world. I know that might seem rather strange – in fact, it’s almost shocking given the things they’re doing at the same time. But it’s true that bringing more tourism to North Korea is something they’re saying all the time that they want to do more of. So I think to them, allowing me to make this film was a sign of flexibility. To them it was a really big deal too, because they had never done something like this before. I mean, even the guides were telling me so. The fact that I could talk to people was not normal and it was not something they were comfortable with. Obviously somebody had just decided to give me a lot more freedom, and the logical conclusion to take from that is that they are trying to give a much better image of the country. I don’t think Alejandro thought he could ever manipulate me into making a propaganda film, either. I was always very clear with him that I was not going to do that. I think they just really had to take a gamble, and I’m not really sure that it’s worked out for them. Although I do know that they are very happy with the movie. Alejandro, for example, saw the film and was very happy; he told me it was the first time he’d ever seen a North Korean eating an ice-cream in a documentary about the country [Chuckles.] That for him was a big success. But can you kind of see where he’s coming from on that front? Perhaps this is the first time we’ve ever seen that in a film. Yeah, absolutely. I’m sure anyone who has seen some of the documentaries that already exist about North Korea will know that there are those which are very complementary (and essentially they are propaganda themselves) or there are the films which are just purely negative about all aspects of the country. But you know, they’re smart enough to send missiles into orbit in outer space, so they’re definitely not completely stupid. They do kind of know what they’re doing. I just really don’t think the outcome of what is happening is ideal for them. I mean, they’re definitely not Dr. No, which is what we’re lead to believe in films all the time. It’s not like Kim is just going to press a button and destroy the whole world – that’s just not the case. Did you ever find yourself coming to agree with the things Alejandro or the other North Koreans had to say during the course of your film, then? Look, I would say I definitely admit to being a victim of propaganda in my own very special way. I mean, when most people make a documentary about North Korea, they generally all approach it by doubting everything they’re told and they can be quite hostile too. I was not really trying to do that. I wanted them to open up and relax, so to a large extent I toed the line as much as I could, because I wanted to respect their beliefs, you know? I always tried to be very friendly and understanding and put myself in their position. At some point, though, these conversations really took effect over me – and it wasn’t just me who felt like that, the whole crew felt the same way. We were seduced by this marvellous world where everything just works fantastically and everyone is provided for. You know, you’d go through all of these tours for eighteen hours a day with everyone always smiling at you and telling you how wonderful everything is – it does have an effect. But at the same time, we did realise that we were to some extent victims of the Stockholm syndrome [Chuckles.] In fact, I even mention this in the movie. So, I mean, if this is what happened to me in just ten days, imagine if you lived there for a whole lifetime? You’d either believe absolutely everything that this system tells you or I suspect you’d be very, very, very unhappy. But I also felt your film did a good job at exposing a lot of the Western propaganda that surrounds North Korea too. Was that was very important for you to do? Well my film is basically first and foremost about propaganda, because during the creative process I began to realise that I would never be able to understand the situation fully or find all of the answers that I wanted. I had to make peace with the fact that it was not going to be possible to arrive at these kinds of things. I was never going to be able to give a final answer about how people live there or this is how the economy works. And why do you think the North Koreans have become so invested in such a pervasive culture of propaganda? For them I think it’s more aimed at creating the message, “Don’t mess with me, because I could do this.” That doesn’t mean they’re necessarily going to do anything, but the possible threat does mean that we have to have talks with them. In fact, that was one thing that I really felt whilst I was out there: the North Koreans would love to be considered more important than in reality they actually are. However, they would also genuinely like to have peace talks with America, because at the end of the day this is something that they have demanded and not received. That was because the Americans seemed to decide that these are not the kinds of people they’ll discuss peace with, I guess. But the idea that the Korean War is supposedly still active is very strange to me – it’s probably the longest running war there’s ever been and soon it’ll make its way into the Guinness World Book of Records. It’s not really still active though, so it’s just strange. Did you ever think in some respects the North Koreans were right to be so angry about what they describe as American “imperialism,” then? Well, the North Koreans obviously do this all time. They blame the Americans constantly for everything. It’s actually kind of ridiculous, because there’s decent grounds to argue that they should be just as angry with the South Koreans or the Japanese. But no, it’s just a whole country aimed and designed to trace all of its grievances back to North America. Every evil in their society – the reason why things aren’t working, the reason they don’t have any food, the reason why they have to spend so much money on their military, the reason why their lives are not better – it’s all because the Americans are threatening to destroy them. This was just like a constant propaganda message in North Korea, all day long. And it’s a message that’s been used many times before, no? Even with many of the communist countries that existed before, it can be very convenient to have an enemy. That goes for both sides too, because also for the Americans it’s very convenient. If they’re able to make North Korea look like a very mean and dangerous enemy, then they have a good enough reason to position their troops at the doorstep to China, which is what they really want. Do you think you will ever go back to North Korea now? I don’t think so [Laughs.] I mean Alejandro kindly keeps inviting me and telling me that’d I’d be fine if I came back. I’m still not sure I would go back though. It sounds like you think the Human Rights crisis in North Korea is really pretty bad, then? Based on what I have heard from people who have studied the situation, I think the human rights violations are probably quite bad. I think that the conditions in the prisoners’ camps must be terrible, and I think that much is obvious from the people who have come out from the report that was done by the United Nations. It must be terrible, and obviously a very painful experience as well. I mean when you’re in jail in a very poor country like North Korea, there won’t be any real food provided for you or any real acknowledgement of what we perceive to be human rights. It’s almost not so much that they’re really breaking the laws either, as far as they’re concerned the rules are different. And what do you think would happen if a North Korean had made your film? If you’re a critic of the regime, you’re a convict. That’s it. It’s as simple as that. I mean, that’s just the rules of the game there. Human Rights are not rules that they play by. And from that, I also believe that you can basically assume that the situation would be pretty bad for anyone who would try to make a film like mine. Especially considering there’s 200,000 political prisoners in a country of 24 million people too. It’s quite a lot when you think about it. Though at the same time I probably should say that I do not think that North Korea is the country where the biggest human rights violations are taking place. There are many countries around the world where people are committing much worse atrocities, and they’re not really talked about as much, so that is also something that’s worth thinking about. But I have no doubt that there is an issue in North Korea, I mean even Alejandro says it: “for them, human rights is a different thing.” So they don’t play by our rules.